One point of note on the annual calendar of energy events is the release by BP of their Statistical Review of World Energy. The data, all available to download in Excel format, covers the period up to the end of the previous year (i.e. the current data is to the end of 2013) and as such is about 18 months ahead of the equivalent data from the IEA (which is currently up to 2011 but will be updated later this year). 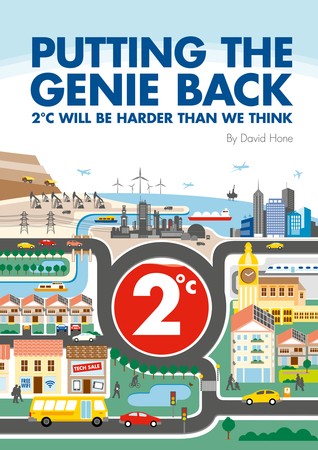 Just about anything you might want to know on energy supply, energy consumption, CO2 emissions, fossil fuel reserves etc, is there for the interested user. In recent years BP have updated the tables to include a more comprehensive look at renewable energy as well. Global CO2 emissions just keep on rising: This is hardly a surprise, but given the recent burst of capacity from the renewable energy sector there might be some sign of some levelling off at least. 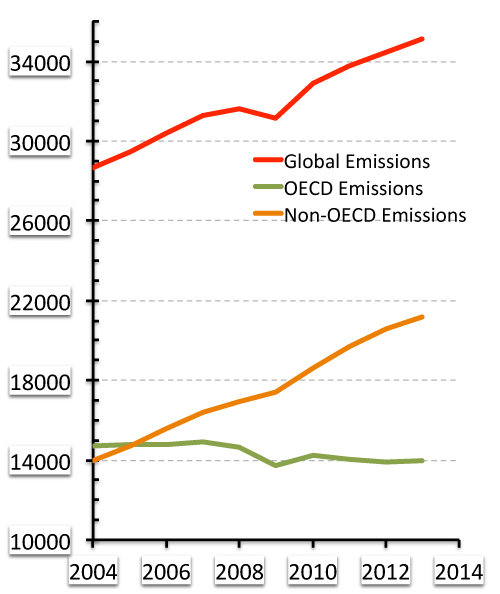 OECD emissions are at least flat now, but non-OECD emissions continue to rise sharply as coal use increases in particular (chart below in millions tonnes CO2 per annum). 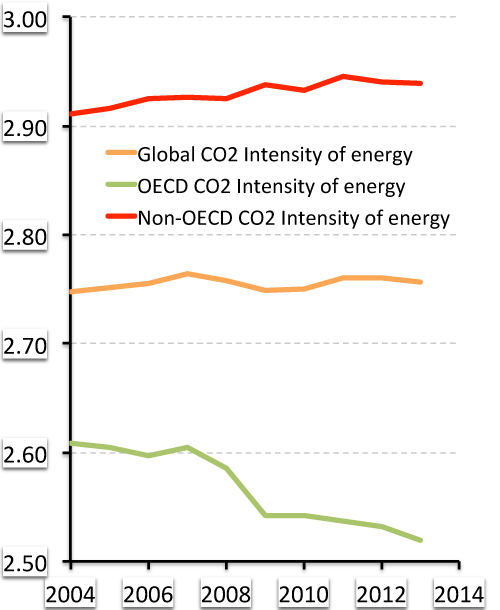 The global CO2 intensity of energy isn’t budging: This is a bit more surprising given the influx of natural gas into the global economy and the build rate of renewables. But coal continues to surge and quite some nuclear has been shut down in Japan. The chart below shows the OECD intensity falling as renewables take off in Europe and natural gas increases in the USA, but non-OECD intensity offsets this to give a flat picture overall (chart below is in tonnes of CO2 per barrel of oil equivalent). The annual increase in fossil fuel use far exceeds the increase in renewable energy production: While many will readily quote the annual increase in renewable energy investment or annual increase in renewable energy capacity as evidence of turning the corner, the reality in terms of renewable energy produced is somewhat different. The chart below compares the annual coal increase with global solar and wind increases. For reference, the total fossil fuel increase from 2012-2013 was 183 Mtoe (million tonnes oil equivalent). The whole picture is rather distorted by the global financial crisis, but coal alone is increasing by something like 100-150 Mtoe per annum. 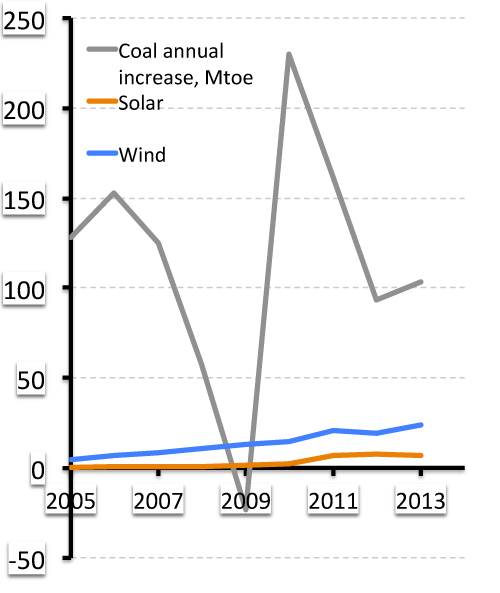 At least for the last couple of years solar has been flat at about 7 Mtoe annual increase. 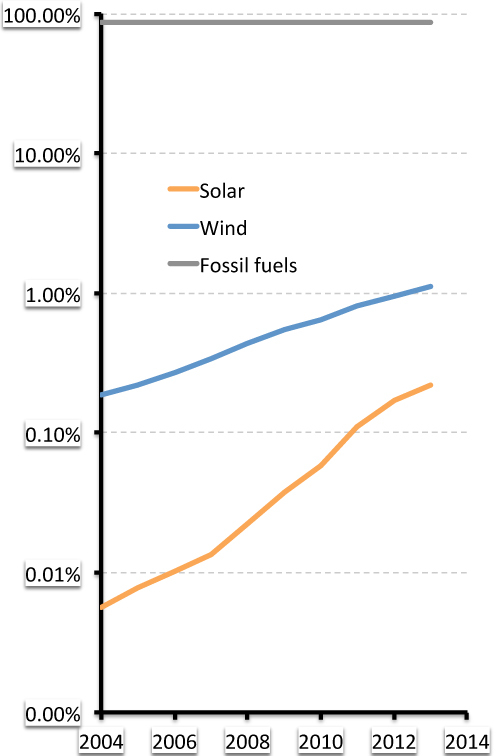 Solar and wind are growing rapidly, but the fossil fuel share of global primary energy is high and steady: Both solar and wind are in their early rapid growth phase where double digit annual increases are expected, but as they become material in the energy system at around 1% of global energy production, don’t be surprised to see this start to level off. The chart below has a log scale (otherwise solar and wind are barely discernible) and shows fossil fuel up in the mid 80’s as a percent of the global energy mix. Even in Germany it is taking a while for solar to make a showing: While solar PV in Germany is having a profound impact on electricity generation on long sunny days in June, the annual story when looking at total energy use is different. Solar has reached about 2% of the mix (i.e. reached materiality) and might even be showing some signs of slowing up and growing at a more linear rate (but a few more years data are needed to see the real trend). Again, this is a log chart. Thanks to BP for the time and effort they put into this work every year. 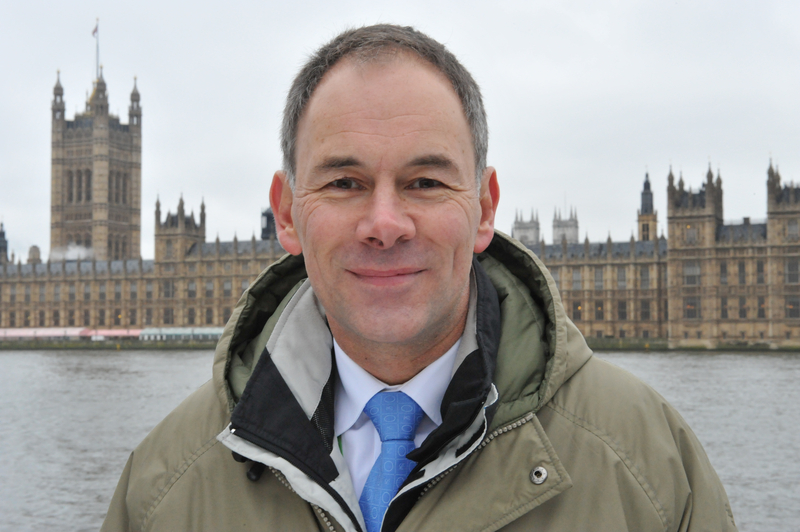 There is a LOT of hype in the energy discourse. It is great to see, once in a while, reality checks like this one. Thank you.